miniOrange provides a ready to use solution for Wordpress. This solution ensures that you are ready to roll out secure access to your Wordpress site within minutes. miniOrange provides secure access to WordPress for enterprises and full control over access of applications, Single Sign On (SSO) into Wordpress with one set of login credentials. 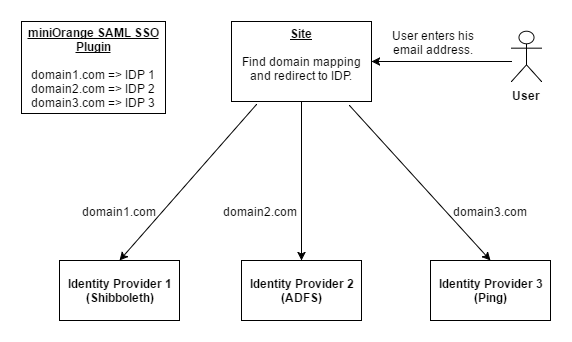 With miniOrange SAML SSO plugin you can configure Multiple IDPs. This allows the users to authenticate with different IDPs based on the domain name in their Email address. For Example - If you have users from from multiple organisations (like Universities), you can configure all the Organisation's IDP and have users authenticate themselves with their Organisation account. 1. If your site have users from different Oraganisations and you want them to authenticate with their Oraganisation account, using this plugin you can do that securely. For example - if you have a site that have users from different Universities, you can force your users to sign in using their University account. 2. Using this plugin you can restrict your site access to the users from particular Oraganisations. If you don't find what you are looking for, please contact us at info@miniorange.com or call us at +1 978 658 9387 to find an answer to your question about Wordpress Single Sign On (SSO).